Don’t let Black Friday shopping lead to a preventable injury. 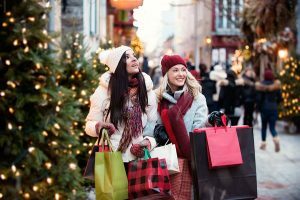 Whether you stand in line in the cold or are caught in a crowd rushing to a holiday sale, it is important to take care of yourself on Black Friday. Here are some tips to help you shop safely this holiday season. Bundle up. If you plan to wait outdoors, make sure you wear weather-appropriate clothing to keep warm. Cold weather injuries can occur in extremely cold temperatures and even at 40 degrees if a person becomes chilled from rain or sweat. Plan ahead for winter weather. Snow and ice increase slip and fall injuries. Wear shoes with good traction, take care when walking, and be mindful of road conditions while driving. Avoid germs. With people pawing through sale merchandise on Black Friday, exposure to germs is inevitable. Keep your hands away from your eyes, mouth and nose and wash hands or use hand sanitizer frequently. And don’t forget to get a flu shot. Avoid maxing out. There’s more to worry about than your credit card limit while holiday shopping. Avoid conflict with other shoppers; keep holiday stress in check and avoid exceeding physical limitations as well. Your health takes priority over a sale. “Don’t be that person who avoided getting care for injury or illness because you wanted a low price on the latest electronic item. If you need care, seek medical attention immediately at your nearest emergency room or express care,” Early added. Need Emergency or Immediate Care? In the event of an emergency, call 911 or visit your nearest emergency department. For less serious injuries or ailments, visit Memorial ExpressCare or use the Memorial Now app for a virtual care visit.